Winds light NW and a blue sky made starting this flying day a pleasure. A little doubt for later was the possible arrival of a frontal system with a lot of cloud. The small, but perfectly formed crew swung into action a soon we had all the people and aircraft in the correct places ready to go. Along with One Day Course candidate Harrison Redwood ( a future Royal Navy Officer apparently ). 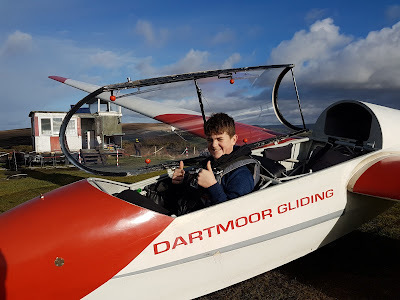 we welcomed visitors Jamie Bird and, Tylo and Jon Coupland for Air Experience flights. Flying was circuits for the most part. Longest flight of the day was by Allan in the K8 who maintained his flight for 11 minutes by ridge soaring the far side of Gibbet Hill. From the airfield this looked an awfully long way away and several members were contemplating getting the trailer ready. Tylo Copland Flew with me. The flying programme was progressing well until the front arrived. The sky went from clear to 8/8ths cloud within 20 minutes; 10 minutes later it started to rain. Ever optimistic we waited for the rain to clear but by 3pm there was no sign of any clearance and, after checking the weather radar ( the wonders of the internet ), the day was scrubbed. 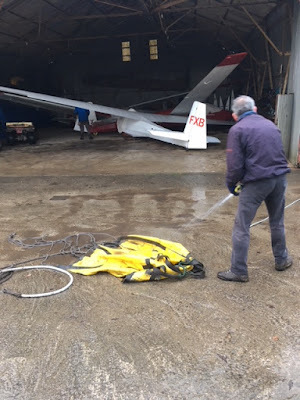 The long walk back to the hangar with the aircraft in the rain was decidedly not fun but soon enough we were able to dry off in the clubhouse in front of the roaring log burner. 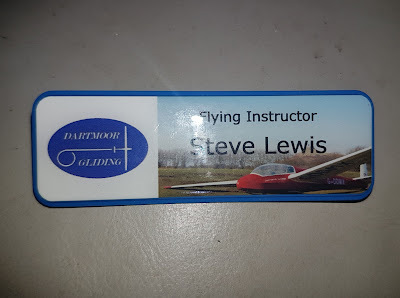 Today saw the Instructors sporting their new name badges. This is part of the plan to make the Instructors more visible to our visitors and new trainees. Today started with a beautiful sunrise as the sun appeared through the gaps in the dark looking clouds. 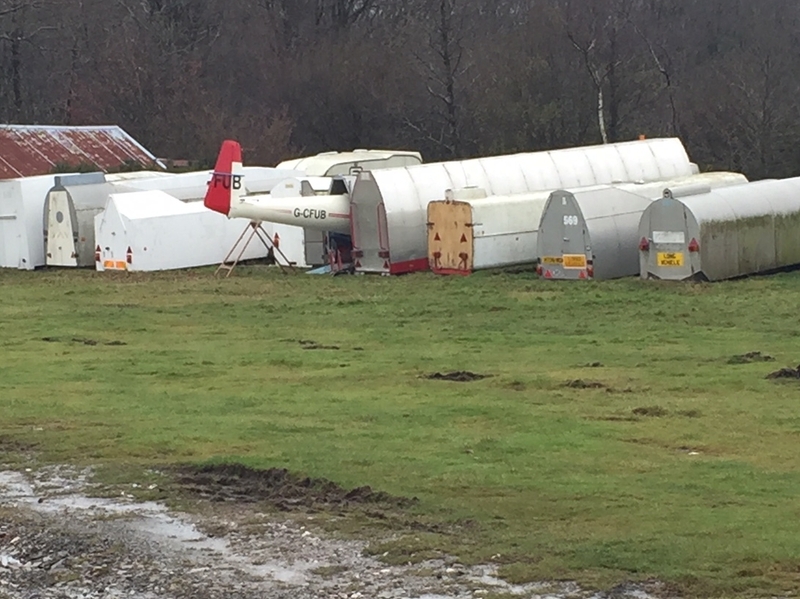 There were weather warnings of high winds for most of the country but after a couple of hours work I headed to the airfield anyway. Looking towards Brentor as I left Plymouth did nothing to raise my hopes, there was a dark, glowering cloudsheet across the whole area. 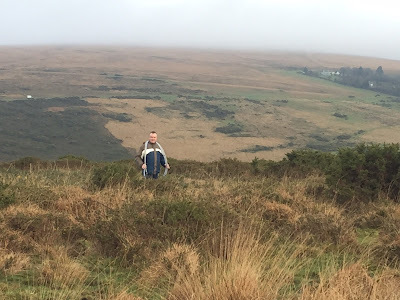 But by the time I arrived the lowest of the cloud had moved away. Good news. There was absolutely no wind. Unusual. 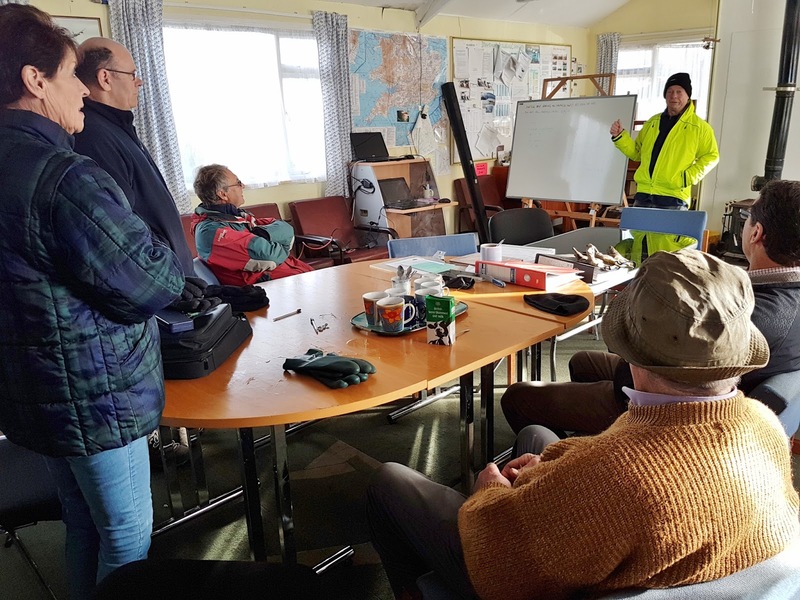 As the airfield was very wet, it was decided to operate with 1 K13 (G-DDMX) and the K8, using the quad bikes for towing duties and the landrovers confined to the centre track. What a nice flying day. Although there was no lift to sustain flights very much the air was glassy smooth making a circuit a very pleasant experience. 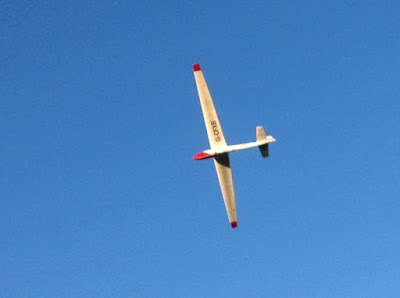 Longest flight of the day was only 9 minutes by Allan Holland in the K8 who used a 1450 ft launch and a gentle minimum sink flight. We welcomed 3 visitors today, Chris Duggan, Glyn Webstor and Michael Hills, who all enjoyed Air Experience flights. 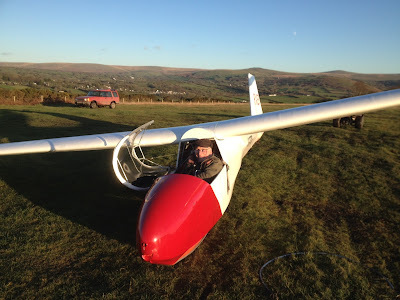 At the end of the day, after washing the gliders, it was discovered that the generator would not run properly. This gave Rick and Scratch an opportunity to get a bit oily and apply their usual diesel cologne while cleaning the filters and fuel pump to bring this venerable old machine back to life. Thanks chaps. A pleasant day at the airfield. With a moist north-westerly it was no surprise to find the airfield shrouded in low cloud. 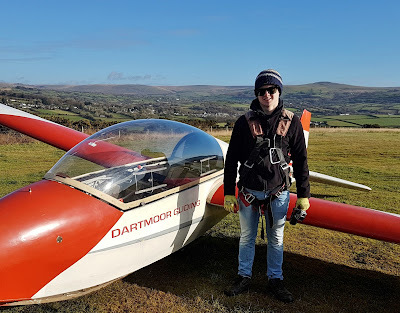 Today our CFI Don was attending to help Martin prepare for his Full-Cat rating. 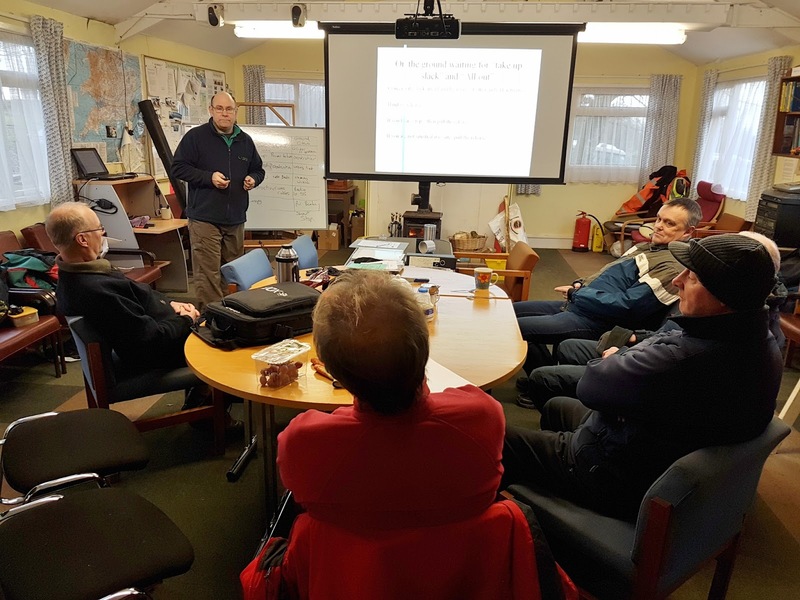 First up was for Martin to give a morning briefing to decide if we were going to be able to fly. With most of the met forecasts predicting low cloud and possible rain later in the day it was looking doubtful. But RASP gave a glimmer of hope that the cloud would be high enough for those who wanted the get some cable break practice around mid-day. While we waited it was time to put the kettle on and settle down for a lecture on the theory of flight given by Martin. This was added to by Don in his usual manner and kept all interested until it was time to look outside to see if the weather was behaving as per RASP. 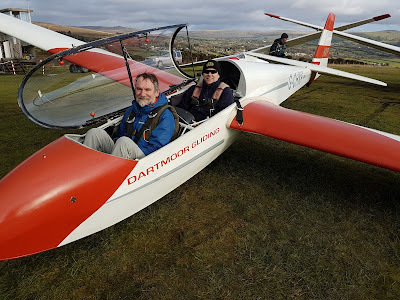 Although there were some different views as to the cloud base, Martin declared we would get one of the K13’s out and give it a go. So all hands to the pumps and the airfield was readied for some cable break practice. 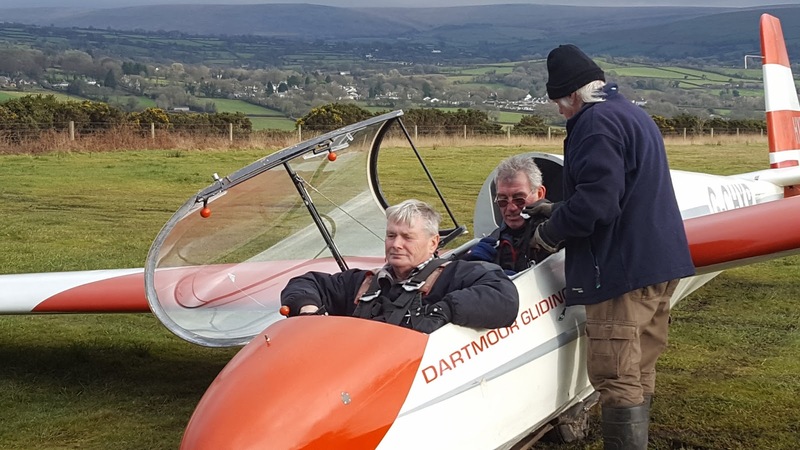 First flight saw the pairing of Don & Martin, with Martin demonstrating to Don the correct procedure for a cable break. They did wait until just before going into cloud at 800ft before pulling off. Next flight was the same pairing, with Don playing Bloggs for the same exercise. 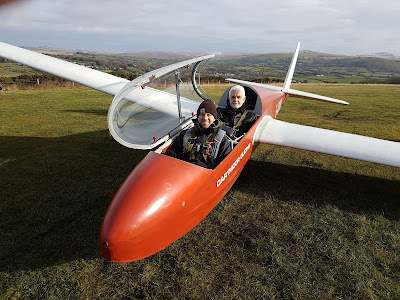 While Don and Martin debriefed, I settled into the back seat ready to put Dave Downton and then Ed Borlase through some launch failure practice. After six flights and the rain approaching from the north obscuring Brentor it was a quick retreat to put the gliders away and wipe them down. 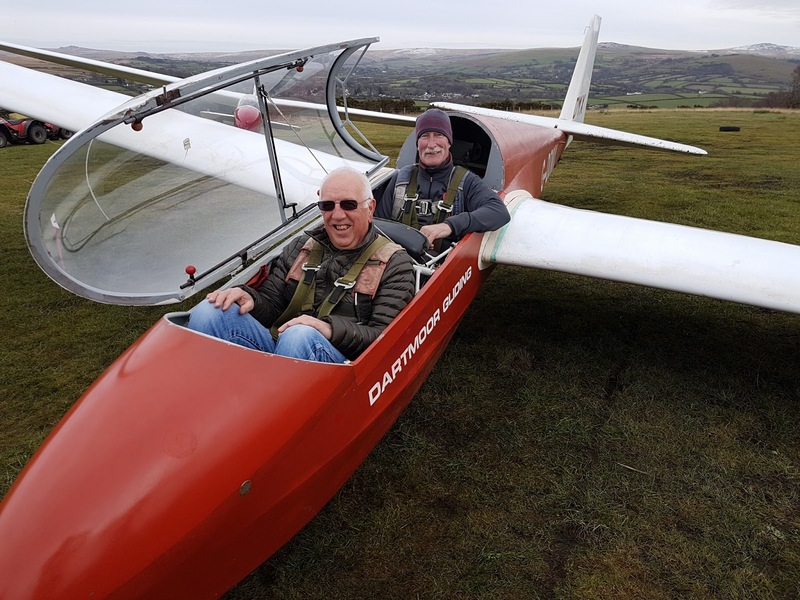 A big thank you to Richard for winching, Leith for retrieving and Roger for helping at the launch point; all without flying. After the beautiful clear skies of Friday, Saturday was definitely a disappointment; There were patches of low clound everywhere. 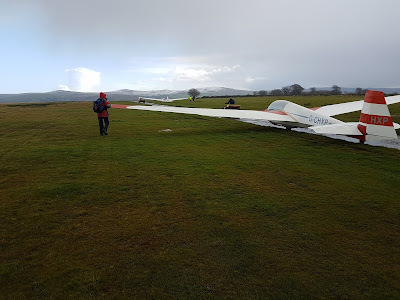 For quite a long period there was some clear air directly over the runway to tease us, but within half a mile the cloudbase was at ground level. At least the decision not to fly was not complicated. 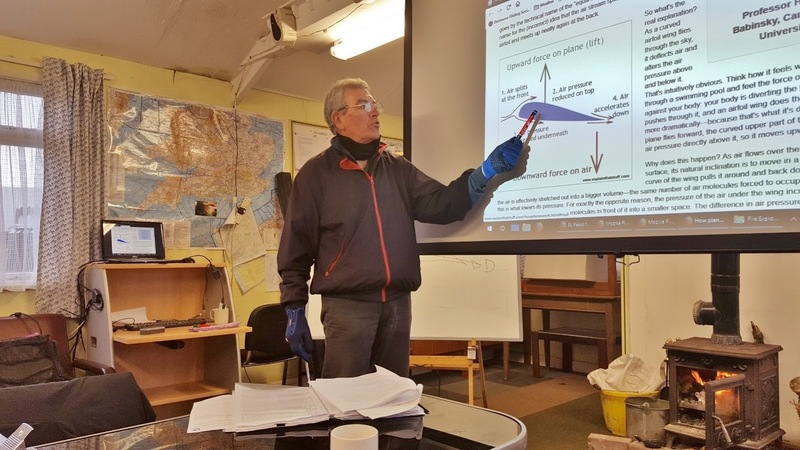 Rick set up and delivered a well attended lecture on "Launch Failures" which generated lots of health discussion. This was followed by a strop hunt on the sides of the airfield. 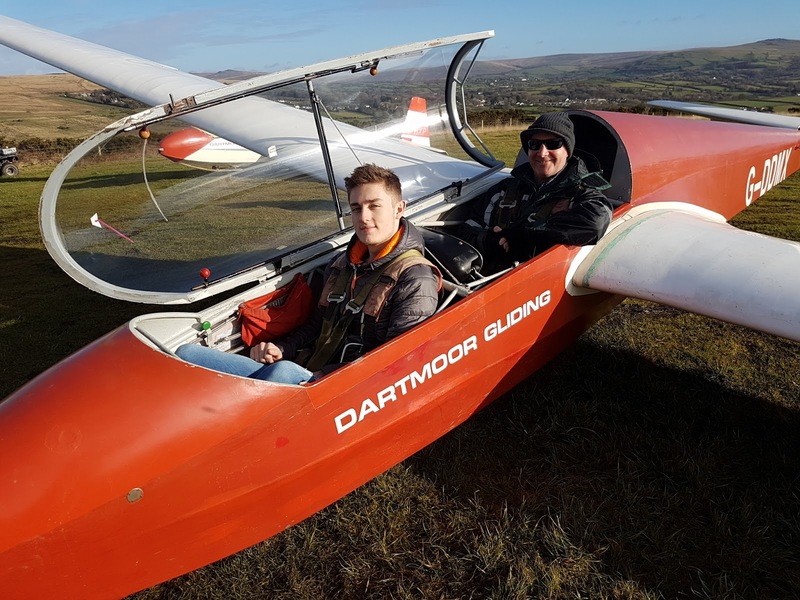 Trainee pilot Dave Archer found two strops; the rest of us, none. Must be beginners luck. After lunch David was treated to a One to One discussion on Navigation and Altimetry. 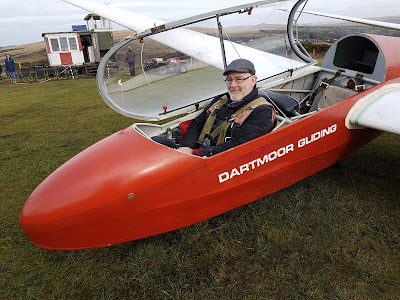 Colin's K6 made a brief appearance for some fettling of the tail skid. A cold frosty start greeted the Wednesday regulars. After a few texts between Phil and the crew we eventually mustered at the airfield. Unfortunately Allan and I were not able to get there until 1145 by which time Phil and Bob had got everything ready to go. It was bitterly cold though as you can see in the picture of Allan all huddled up in the K8. But the views were terrific and the sky a fabulous blue. Once again Colin and Dave were seen slaving away in the workshop, many thanks chaps. The forecast looked hopeful. 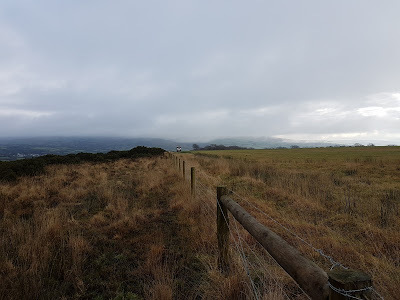 Although it has been very wet all week today looks like a period of slightly better weather with wintery showers and sunny periods although there is a possibility of thunderstorms later. 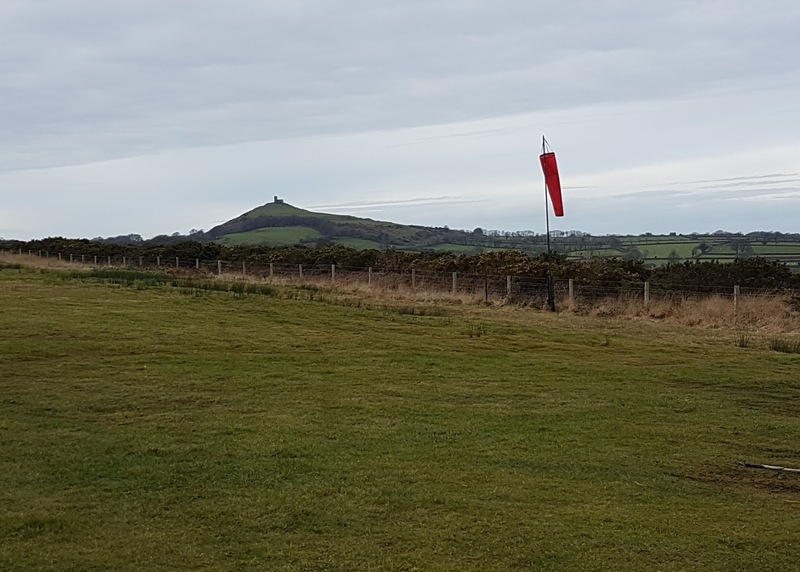 Forecast wind was 8 knots from the west but at first there was no surface wind at all the windsock just hanging forlornly on it's pole. 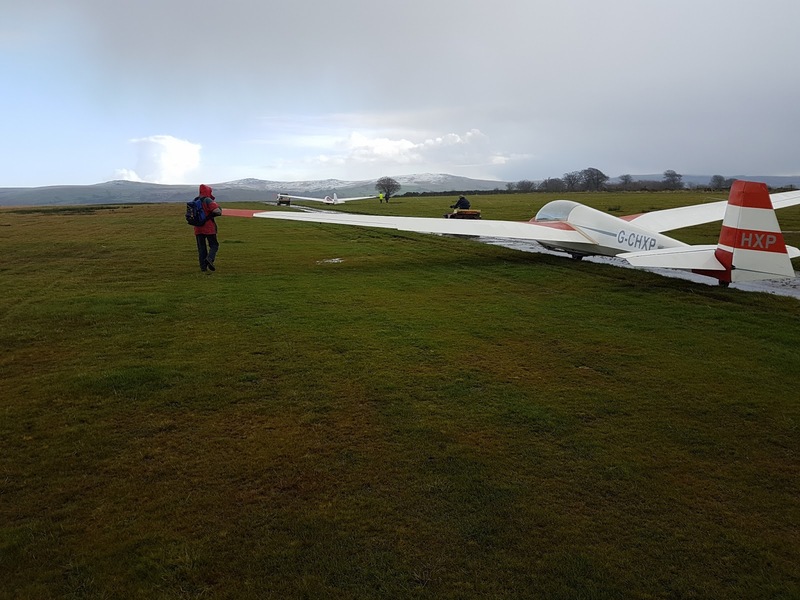 After a careful pitch inspection it was decided that we could do some limited flying if we took care with the wet runway; ie. retrieve by quad only, Landrovers constrained to the track, no turning gliders on the spot (they tend to dig themselves in ). We welcomed Sally Cunis who returned to complete her One Day Course. Sally took a further 3 flights today during which she made good progress at handling the controls. 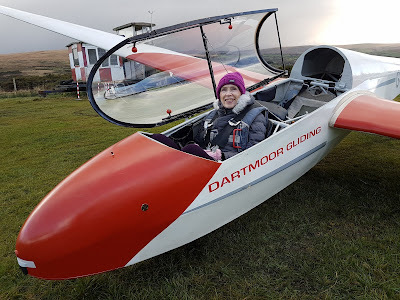 We look forward to seeing her soon to continue her flying training. The other flights today were check flights by experienced club pilots who kept today's instructor, Gordon Dennis, busy in K13-GDDMX. 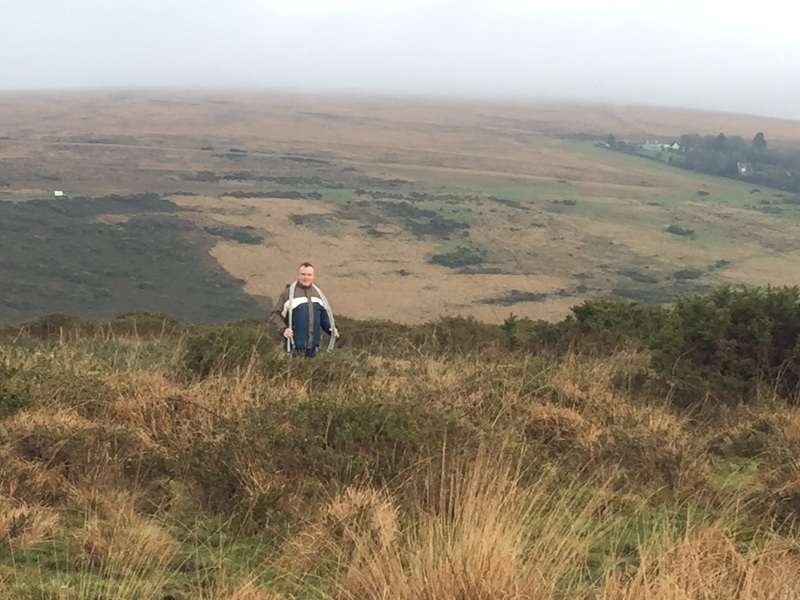 Our thanks today to all those who helped but especially Heather for driving retrieve all day, and Barry and Rick for the lion's share of the winch driving. 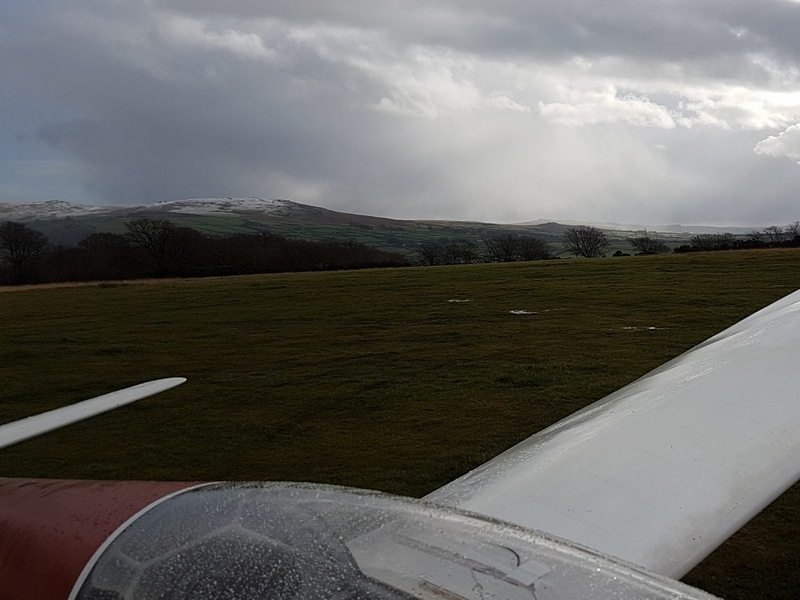 Flying was stopped early to limit the damage to the runway and to allow the instructors to head off early to Tavistock for the Instructors Meeting.